The Daily GRRR! HEADLINES for April 24th, 2015. 1. Settler Killers of Loretta Saunders Plead Guilty. 2. Montreal Woman Found Guilty For Posting a Picture of Graffiti. 3. Quebec Town Enacts By-law Against Insulting Local Police. 4. Ayotzinapa Delegation in Quebec Testifies on the Human Rights Crisis in Mexico. 5. Mining Companies To Be Targeted in Toronto. 6. #DamLine9 Blockaders Emerge From Court Unrepentant. 7. Enbridge Has Rough Week With Fines and Political Interference. 8. Marineland Animal Defense is Dead, Long Live Marineland Animal Defense! 9. Support The Tower - Hamilton's Anarchist Social Space Needs a Ramp! Welcome, I am your host Dan Kellar and you are listening to The Daily GRRR! Waves Through Walls: Prison Radio, on 100.3fm, CKMS in Waterloo, Ontario. Soundfm.ca on the web, today is Friday April 24th, 2015.
with his piece entitled The Day the Philly Police Bombed MOVE. Check prisonradio.org for more podcasts. Today’s feature is a piece from PRI's Rae Ellen Bichell on the "Open Prisons" of Finland where ongoing imprisonment reforms have led to a ⅔ reduction in the prison population in the Scandinavian country. 8. Marineland Animal Defense is Dead, Long Live Marineland Animal Defense! 9. Support The Tower - Hamilton's Anarchist Social Space Needs a Ramp! The settler man and woman who killed Inuit graduate student Loretta Saunders last year have pled guilty to first and second degree murder respectively after first pleading not guilty last year. Blake Leggette and Victoria Henneberry had subleted a room from Loretta in early 2014, and after running into financial difficulties, ambushed and killed Loretta in February 2014, stealing her car, bank card and drivers licence. Saunders, who had been researching missing and murdered indigenous women fought back against her attackers but was eventually killed in the attack. Legette will be sentenced to 25 year in jail before eligible for parole while Henneberry will be sentenced to between 10 and 25 years before eligible for parole and will be back in front of the courts April 29th. A woman who was arrested and charged last year for posting a picture of graffiti she found in her neighbourhood in Montreal has now been found guilty of criminal harassment in the case. 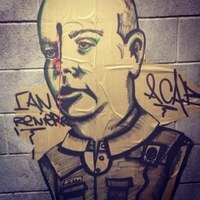 During the large scale demonstrations and student strike in 2013 in Quebec, Jennifer Pawluck took a picture of graffiti she found which showed SPVM Cmdr. Ian Lafreniere with a bullet through his head. Lafreniere oversaw and directed much of the violent and often illegal police repression of students and others during the social unrest in 2013, and claimed the picture of the graffiti scared him and his family. While Pawluck claims she did not even know who Lafreniere was when she posted the picture of the found graffiti, she will find out on May 14, what her sentence is for the summary offence which has a maximum sentence of six months in jail or a $5,000 fine. So much for freedom of expression. The small town of Granby in Quebec is looking to grasp far beyond its reach in trying to limit free speech on the internet. The town seeks to amend an existing bylaw to prohibit anyone from making defamatory statements or slurs against city employees online - this would include local police. The small town seems to be oblivious to how the internet works and how freedom of expression is protected in Canada. In interviews with the CBC, a representative from the town stated "We've given statements of infractions to people who have insulted police officers on the net or through social media...Are we insulting a police officer in the discharge of his duties? That's the offence that we are rewriting, if I may, in a very clear manner that regards social media and internet." It will be interesting to see how the city actually applies the bylaw to its residents as well as those beyond the town's borders. Family members of the 43 disappeared teaching students from Ayotzinapa, in Guerrero state, Mexico are in Canada this week to bring attention to the case and to bring pressure on the Canadian government's ongoing support for the corrupt political situation in much of Mexico. Hilda Legideño Vargas, mother of one of the missing students said in a press release: "We are in Canada to inform the public and ask for your support to urge the Mexican government to uphold justice, investigate the students’ forced disappearance and above all, bring us back our children. Because here, the government doesn’t pay attention to us,"
Marie-Ève Marleau, from the Committee for Human Rights in Latin America (CDHAL) states, "A serious human rights crisis is currently ongoing in Mexico, with sources from the Mexican government itself stating that more than 23 000 people have disappeared between 2007 and 2014. Nevertheless, Canada recognizes Mexico as a 'safe country.' The safe country delegation means Canada will not accept refugee claimants from the oppressive state and continually deports migrants back to Mexico where they face violence and death. The final stop on the tour will be April 28 as the members of the caravan meets with the Parliamentary Subcommittee for International Human Rights, in Ottawa. MiningJustice.org has accounced a series of events and actions to confront several transnational mining companies who are based in Toronto as they hold their annual shareholder meetings. 80% of the world's mining companies are based in Canada and have come under increasing scrutiny for their links to violence against indigenous, environmental, and anti-mining activists. While the first event to support the Clyde River Inuit took place on April 20th, a full schedule of events still upcoming with protests on April 28 with the Confront Barrick: Stand with Impacted Communities (click here for the FB event) event, on April 29 National Day of Action to Stop Mount Polley Reopening, on April 30th with the No More Goldcorp, No More Murders: Goldcorp AGM Memorial March, on May 1st with a mining justice contingent in the No One Is Illegal May Day March and the May 8 demo at the Centerra Gold AGM with an action called 10 Steps to Mine a Political Conflict. May 10-16 is Mining Justice Week with events and actions across the country including the May 12 Digital Day of Action for Mining Justice, the May 15 - Stop the Suits action which will support Sovereignty for El Salvador, and demand a shut down to OceanaGold’s lawsuits against the country, as well as the May 22 convergence at the Hudbay Minerals AGM with the Corporate Criminals! Check http://mininginjustice.org/spring-into-action-2015/ for a full scuedule of events inculding the demos, documentary screenings, and art nights. The final court day for 5 Ontario based activists who were arrested at the end of a 7 day blockade of a worksite for the Line 9 tarsands pipeline had their final court appearance with "discharges being granted for four of the five individuals with the fifth individual receiving a suspended sentence with probation, having incurred additional charges from her involvement in previous anti-petroleum and anti-pipeline actions. Enbridge had been pressuring the crown prosecutors into seeking harsh punishment for the 5 arrested at the multi-day work-stoppage. The press release from the defenedants quotes defendant Rachel Avery saying on leaving the Woodstock courthouse. "The tar sands and fracking are still lethal industrial projects… Line 9 represents the reach of tar sands destruction and expansion here in south western Ontario, so it’s a crucial point of environmental protection." Another of the accused, Trish Mills stated "the reality is that whatever the consequences I face - now or in the future - I believe in what I’m doing. I can’t regret working to stop a pipeline project that will contribute to tar sands expansion. I regret nothing, and I won’t stop now." Line 9 is still not active with tar sands crude as the Chippewas of the Thames First Nation push their appeal of the NEB decision to court in May. A large demo is expected at the court hearings in support of the Chippewas of the Thames' appeal which is based on the principles of free, prior, and informed consent. And in more setback against the company, it was announced earlier this week that the Enbridge pipeline company will have to pay 70,000$ in fines following an investigation from the Environment Ministry into their handling of contaminated water from contaminated pits that were excavated in 2013. Instead of dealing with the contamination, enbridge pumped the water into drainage ditches which lead to the St. Clair river. The fines will not cover the cleanup of the contamination and represent a meaningless fraction of enbridge's yearly profits. The Anishinabe of Aamjiwnaang will not receive any compensation for the ongoing contamination of their lands by enbridge. It was also revealed this week, through poor redacting by one of Mike Duffy's staffers, that Enbridge had off-the-record discussions with the senator which they failed to report to the lobbying registrar. In a super piece from the Vancouver Observer it is reported that from "late 2009 to the end of 2011, there are no redactions in the diary. Duffy redacted entries during the period from January through June, 2012, and the most frequent redactions concern Enbridge or environmental charities — over a dozen in all." As Duffy's redactions were unsuccessful in covering-up the truth, they are a revelation into the corrupt lobbying practices being condoned by the canadian petrostate represented currently by Harper's conservatives. In a move that has shocked many in the animal liberation and activist communities, the group Marineland Animal Defense has announced they are disbanding after several years of successful mobilisations and demonstrations aimed "to end animal captivity at Marineland through increased demonstrations and increased public scrutiny." While the group faced legal challenges from Marineland and a largely hostile city council, demonstrations built up over the years with more than 1000 people taking part in the 2013 Opening day demo. Over the years, MAD has worked to highlight the mistreatment of animals by Marineland, highlighting the cruel actions of the captive animal facility's owner John Holer. In the statement released on their website, MAD states: "We close today proud of what we have accomplished, hopeful for what is to come out of it, and dedicated to the idea that we live, work, play and struggle in the communities we create. Compassion, justice, equity, are all important values we can incorporate into our lives on a daily basis and on broad terms. Refusing to see wild animals as commodities, as assets and profits, should be part of a larger project to revise a society that made such things possible in the first place. At our best moments, together, our energy pointed to this – another world is possible." MAD organiser Dylan Powell is still the subject of a 1.5 million dollar SLAPP suit launched by Marineland in response to the successful mobilisations against the captive animal facility. With 7 days left on their spring fundraiser, Hamilton's anarchist social space, 'The Tower" is asking for your support so they can build an accessibility ramp and other upgrades to their facility. The grassroots self-funded, all volunteer space notes that in it's first year, the tower has hosted "countless workshops, film screenings, discussion groups, and presentations. We’ve offered meeting space for local activist groups and community organizations. Several autonomous projects, including The Tower Inprint (a radical print shop), The Armando del Moro Library (a subversive free lending library and archive), and Semo Distro (distributor of books and zines) have made the space their home. During our open drop-in hours we provide a physical space for people to discuss, ask questions, read books, and engage with anarchist ideas." While seeking 2000$ in the current campaign, the tower also seeks monthly sustainers to help the operation thrive. Check the website out to support the tower and to learn more. You are listening to Waves Through Walls edition of The Daily GRRR! Today is April 24th, 2015, my name is Dan Kellar and we are now moving into the feature portion of our broadcast. That was a piece from PRI's Rae Ellen Bichell on the "Open Prisons" of Finland where ongoing imprisonment reforms have led to a ⅔ reduction in the prison population in the Scandinavian country. Stay tuned in for more Grand River Radical Radio after we close the podcast .